Syscon Engineers takes great pleasure in introducing itself as one of the leading manufacturers of equipments required for oil & gas, chemical, petrochemical, bio-chemical, & Pharmaceuticals Industries. Syscon Engineers is known for its exceptional ability to design, fabricate and deliver wide range of tailor made equipments as per Indian & International Standards, like pressure vessels, heat exchangers, distillation columns, reactors, lead lined and rubber lined vessels, agitated tanks multi-effect evaporation systems, crystallizers with outstanding quality, precision, complexity and Third Party Inspection. We also have special expertise in designing, manufacturing, erecting and commissioning turnkey projects. 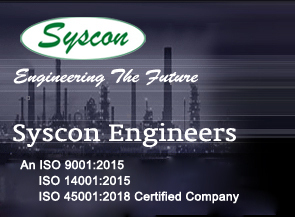 Syscon Engineers was started in the year 1995 as a diversification of M/s System Consultants. Since then we have served a diverse base of regional, national and international customers. Syscon Engineers has firmly established itself in the industry. We have developed healthy and trusted business relations with our customers and suppliers. The journey so far has been very gratifying but we believe that this is only the tip of the iceberg... there is more to come.